Product Description Fully digital Tower Control Panel. The CPX also features our new self-adaptive technology that actively tracks and adapts to changes within the bath. 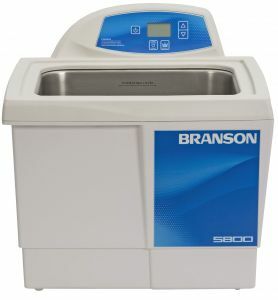 All Bransonic baths can also be used for cell separation, sample preparation and degassing of liquids. - Constant activity/power tracking automatically maintains the same ultrasonic power by adjusting for changes in liquid level and temperature caused by a light or heavy load. This helps ensure more uniform cleaning and consistent performance, even with multiple users or when bath conditions change. - Assures uniform, precision cleaning over the entire surface, and consistent cavitation that reaches and cleans even tiny crevices on the parts. - High/low power control adjusts the acoustic energy in the bath. It can be set at 100% power for normal to heavier loads, or at 70% power for lighter and more delicate applications, helping to protect delicate components from potential damage. - Temperature settings are available up to 69C/156.2F, which can be set in either Celsius or Fahrenheit and programmed through the front panel for easy access and monitoring. This also allows for convenient re-calibration when needed onsite. - High-temperature visual alarm/auto shut-off for added safety. - Sleep mode provides energy savings automatically by shutting off unit if control keys are not touched within 15 minutes of cycle end. To restart, press any key. - Degassing and conditioning of solutions through advanced wave modulation of up to 99 minutes also allow for a variety of sample prep applications.